Now that we have accepted the ascendancy of Node.js in the world of web development, it is important to note that Visual Studio has a variety of extensions that allow us to take advantage of an incredibly mature Node Package Management (npm) ecosystem from within the comforts of our favored IDE. You pagkage.json defines the npm packages you want to install, maintain and execute, however, npm does permit you to run basic scripts. In the above example you can see that I have requested specific npm dependencies (grunt, uglify) and it also contains script called “uglify-js”. grunt - In one word: automation. The less work you have to do when performing repetitive tasks like minification, compilation, unit testing, linting, etc, the easier your job becomes. After you've configured it through a Gruntfile, a task runner can do most of that mundane work for you—and your team—with basically zero effort. gulp - gulp is a toolkit for automating painful or time-consuming tasks in your development workflow, so you can stop messing around and build something. By preferring code over configuration, node best practices, and a minimal API surface - gulp makes things simple like never before. 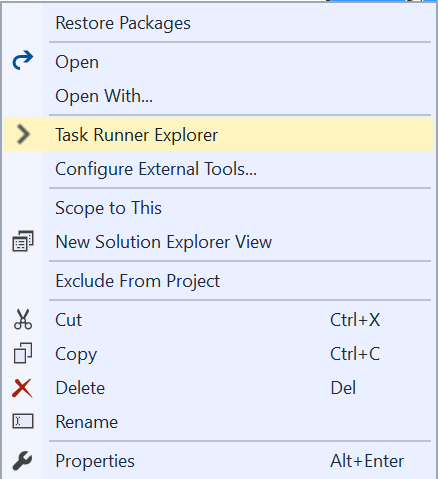 Regardless of your preference you can use Task Runner to tie your configured (or programmed) task to any Visual Studio build event you prefer (Before Build, After Build, Clean, Project Open). For example you can execute LESS, minify, SASS, JSHint, JSLint (and everything else) immediately preceding or during your Visual Studio build process. Open integration is a wonderful thing!